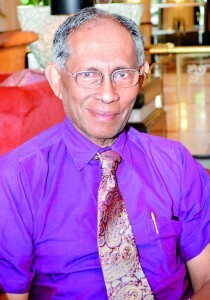 Whether they agree with him or not, most scientists consider Prof. Chandra Wickramasinghe a force to be reckoned with. His early career was marked by a string of honours – graduating in 1960 with a BSc First Class Honours in mathematics from the University of Ceylon, he went on to study at Trinity College and Jesus College, Cambridge, where he obtained his PhD and ScD degrees. His research on interstellar dust won him a Fellowship at Jesus College Cambridge where he would spend the next decade. In 1973, his appointment as the youngest Professor and Head of Department at Cardiff University was a particular triumph. Though it later lost its funding and was shut down, he is credited with incubating the Cardiff Centre for Astrobiology. He is currently the Director of the Buckingham Centre for Astrobiology, University of Buckingham where he has been since 2011. Never one to fear controversy, Prof. Chandra’s recent research has provoked a storm of criticism, with his colleagues in the scientific community questioning in particular his faith in panspermia and the widespread existence of extra-terrestrial life as well as his stance on evolution. Invited to deliver the IESL Ray Wijewardene Memorial Lecture 2014 on July 31, Prof. Chandra will be talking about the search for the origins of life on earth, as he lays out his case for “a major game-changing paradigm shift” that will trigger a sociological revolution with far reaching consequences. – Your family has produced not one but four noted scientists. As a young man, what inspired your interest in science and in astronomy in particular? All four brothers in my family ended up as distinguished scientists in various ways, only Dayal and I were professors of astronomy. One other brother, Sunitha, was a Professor of Haematology at St Mary’s Hospital in London, and my youngest brother Kumar is a distinguished Professor of Nanophysics at the University of California in Irvine. A reason for my early passion for astronomy was my father – PH as he was known – who was himself a brilliant mathematician. He was at Cambridge in the 1930s, a Senior Scholar at Trinity College and a Wrangler in the Mathematical Tripos. He specialised in astronomy and was a pupil of the Cambridge astronomer Sir Arthur Eddington. There was a vast collection of astronomy books in my father’s library, and I believe that it was through looking at these books, and also long conversations with my father that sparked my serious interest in astronomy. I had realised quite early that in order to properly understand astronomy one needed a firm grounding in mathematics and physics, and so when it was time I went to the University of Ceylon to study mathematics. From there I went to Cambridge as a Commonweath Scholar to do my further studies in Astronomy. -Your work on the interstellar medium was ground-breaking and challenged theories that were widely accepted at the time. Would you walk us through your research and its significance? I was very fortunate to be supervised by Sir Fred Hoyle, the iconic theoretical astronomer of the 20th century. Interstellar dust shows up as dark clouds and striations against the background of stars in the Milky Way. In the 1960s when I began studying the nature of this dust, the consensus view was that they were icy particles, similar to the microscopic ice particles that exist in the Earth’s cumulous clouds. I challenged this point of view with my calculations that indicated the dust to be mainly composed of the chemical element carbon. I published my results in scientific journals and in so doing became plunged into my first scientific controversy. It took 10 years of a bitterly fought battle before the carbon dust idea became part of mainstream astronomy. This controversy gave me my first introduction to how scientific paradigms are overturned. Carbon dust in space was not the end of the story. The question of what form this carbon exists in led to my next confrontation with orthodoxy. In 1974 I published the first scientific argument in the journal Nature to propose that the interstellar dust had a complex organic composition, including long chains of molecules. This also provoked controversy, and this second controversy lasted another decade, before it was finally settled in my favour. -When did you first become interested in the origins of life on earth? It was the next step in this train of reasoning that led to my interest in the origins of life on Earth. When you ask the question how could all the carbon in space be turned so efficiently into complex organic molecules, the answer stares you in the face. On Earth almost all the organic material we find is either directly or indirectly the product of biology. So why is the same reasoning not applicable to organic molecules in space? It is precisely this question that led me to reject the Earth-bound origin of life idea in favour of the theory of panspermia – life being a cosmic phenomenon. -As a theory, panspermia is yet to be widely accepted. What would you say in its favour? The existence of complex organic molecules in interstellar clouds and in comets is now no longer a matter for dispute, it is a fact. The idea that these molecules represent early steps towards life originating everywhere is fashionable, but for this there is no experimental support. Ideas of Haldane and Oparin in the 1930’s led to the theory that life originated in a “primordial soup” of organics on the Earth. But this is surely seen to be flawed when you consider the superastronomical level of molecular complexity that is found even in the simplest bacterium. Experiments to simulate an origin of life in the laboratory have been conducted for over half a century and they have all led to dismal failure. The primordial soup therefore remains an unproven and wrong theory. It is based on a pre-Copernican philosophy that argues that we are always at the centre of things. There is also a recent embarrassing finding that life on Earth appears at the very first moment it can survive. This evidence is found in sedimentary rocks dated at about 4 billion years ago, when we know the Earth was severely bombarded by comets. The most reasonable explanation is that the impacting comets brought not only the water that formed the oceans, but brought life as well. Panspermia theory states that the first origin of life occurred on a truly cosmological scale, requiring the combined resources of a very large part of the Universe. Once life has originated, however, its spread from one habitable planet to another becomes inevitable. This idea has received a strong boost from recent discoveries of exoplanets – habitable planets outside the solar system. The present estimate of about 140 billion habitable planets in the galaxy means that the separation between habitable planetary systems average just a few light years. This is a very short distance in cosmic terms and could be easily bridged by exchanges of comets and meteorites. This leads me to the next aspect of panspermia. If life was transferred to Earth by comets and meteorites, such a process could not have stopped at a distant time in the past. Comets and meteorites are with us today and must still be delivering living forms to Earth. Over the past few years this facet of panspermia as a testable theory has come into sharp focus. Balloons sent by teams of scientists in India, Japan and the UK have brought back living organisms (bacteria) that essentially proves panspermia. Critics who dislike this idea continue to say that these must be Earth-bacteria that were somehow lofted from the surface. The Polonnaruwa meteorite of December 2012 has also shown compelling evidence of microscopic life – diatoms, which are microscopic plant life forms. The chemical composition of this meteorite showing a high concentration of the element iridium confirms its cosmic origin beyond a shadow of doubt. But the controversy stems from the fact that on the basis of the conventional primordial soup theory there should be no signs of life in meteorites. It is a case of prejudice dictating skepticism. But I believe in the long term the controversy will be settled by the rapidly expanding body of facts that all goes to support the ideas of panspermia. -Particularly in recent years, your research has often inspired controversy. What has inspired you to persevere in the face of criticism from your peers? Do you believe time will vindicate your work? When every new observation and data supports a theory, one should not give up a fight. I think the data will eventually be so overwhelming that it would be impossible to stop a major paradigm shift from Earth-centred biology to cosmic-centred biology. -How did your collaboration with Fred Hoyle shape your career and influence your research? I found it exceedingly useful to have the support of Fred Hoyle throughout this work. Combating adversaries in controversies of this type could be a lonely business. To have the backing of Fred Hoyle was a tremendous boon. What I learnt from Fred Hoyle was the virtue of obstinacy in sticking to one’s intended course. Only the facts matter in science. Opinions are often misleading and should not be heeded in preference to the facts. -Have you met Ray Wijewardene? Since you will be speaking at an event in his honour, we’d love to hear your thoughts on his legacy. I met him only briefly in the company of my friend Arthur C. Clarke. I think Ray was a remarkable man, a genius. I believe his main legacy is work on inventing machines that helped poorer countries to improve their agricultural yield and facilitate the production of food in a cost effective way. Alleviating extreme poverty is one of the greatest challenges we face at the present time. Ray’s invention of his two-wheel tractor set an example for others to follow. -You are also an award winning poet. Do tell us why haiku imagism is your preferred style and the role poetry has played in your life? I think that the poet, the scientist, the artist all describe the same external universe, but using different tools. I enjoy penning short poems mainly in the fashion of haiku imagism. I think this compact style of poetry is similar in many ways to the rigour and precision of mathematics. This is more therapy than serious creative poetry. Published in The Sunday Times, Sri Lanka on 27 July, 2014. Words by Smriti Daniel. Pix by Susantha Liyanawatte.